The days for maple syrup are fast approaching. I don’t want to be messing around with firewood while we are trying to do that job. I think I got through to everybody loud and clear. One or perhaps two good days and the firewood job will be done. I am pushing that hard. There will be time when the sap isn’t running to work on wood. I don’t mind doing it then. We will see that job completed soon, but in the meantime, my son is back to chasing firewood. Today was an awesome day. It started out crisp and cold, but the sun was shining brightly. The snow glistened as if diamonds had been scattered into it. Just looking at the snow made me smile. I did a little clean up from yesterdays butchering and finished that job. Next it was chores and putting the harness on the horses. 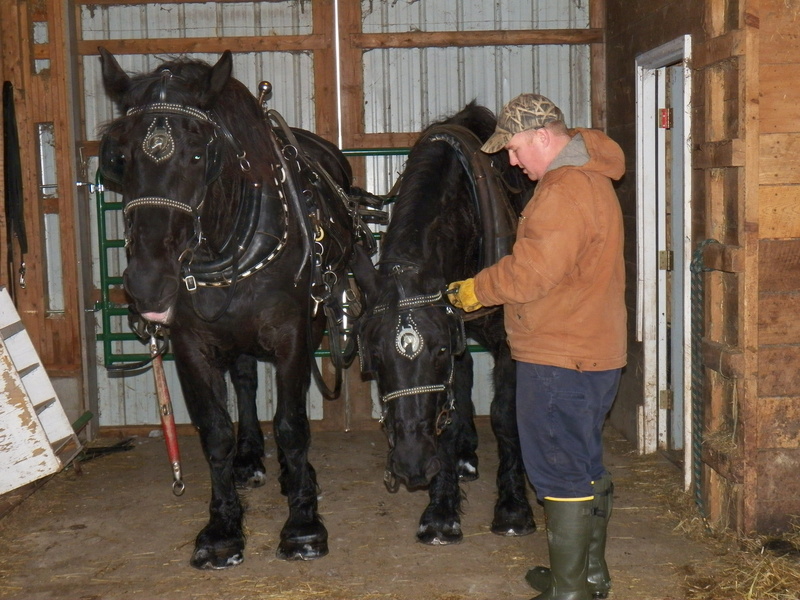 My hired man and my son Jake had the horses ready to go by the time my clean up job was finished. 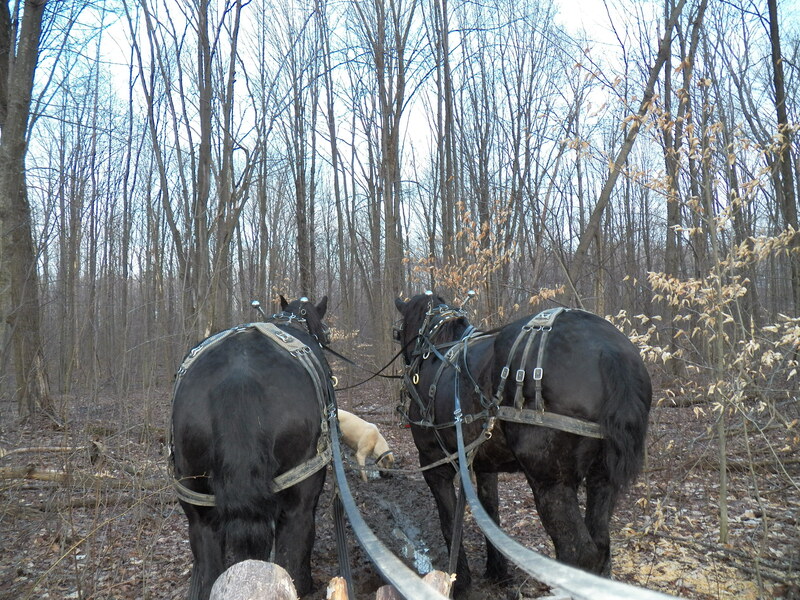 Jake drove Hoss and Knight up and down our maple sap roads, while Justin manned the lopers and cut a whole bunch of face slapping branches out of our way. We continue to prepare for the upcoming maple syrup season. I hitched Duke in the cart and followed along behind. I didn’t do much other than enjoy the ride and exercise Duke. We spent part of a day sharing who was in charge. I won. He had a good time,and performed well once he figured out who was picking the direction we should go. Connie spent the day putting her kitchen back together after the new floor went down. 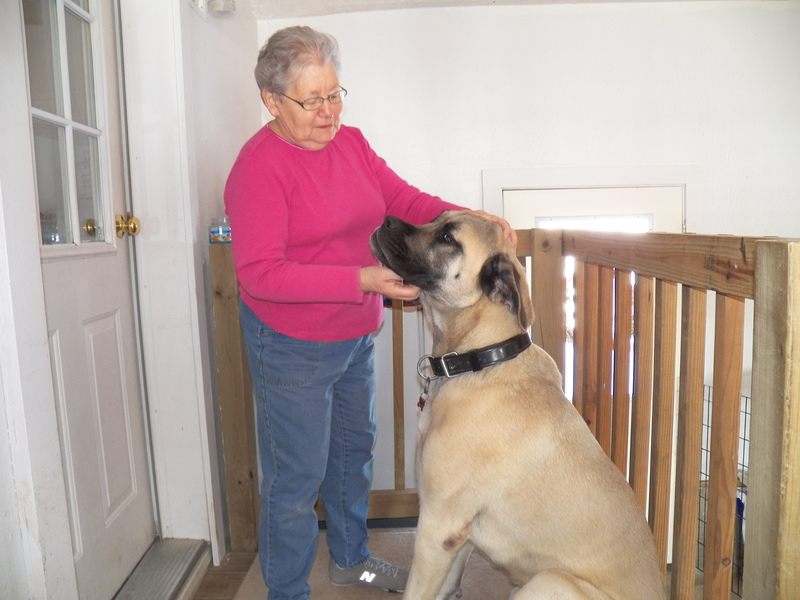 She and King spent a minute visiting while she scratched some of his favorite places. He adores her, as do I. Evening was spent visiting and sharing with an old friend, making plans for next week and resting. My batteries are re-charged and I am ready to face the music of next week. This farm is my sactuary and I will be forever thankful to have it. Yesterday, I taught my son how to walk a pig 😮 We used an old-fashioned pig crate. It is a rectangle wooden box, a little larger than the size of a pig, with no bottom. The pig goes in by way of a sliding door. Two men carry the box by handles on each end. They carry it just up off the ground. The pig walks along because he doesn’t like the box touching it’s rear end. We walked the pigs 200 feet from my son’s barn to my trailer. We made a ramp out of white pine 2×6 inch planks. The pig walks right up the ramp and into the trailer. My son was amazed. The pigs went along without a squeal. They snuggled down in the straw in the trailer and spent the night that way in my driveway. This morning we butchered the pigs. They were dispatched quickly, quietly and humanely. We killed them out on the snow. They were bled out there. We then skinned and finished the job in the shelter of the new slaughterhouse. It is far from finished, but worked very well to keep us out of the wind and cold. We left the carcasses hanging to cool while we cut and hauled two loads of firewood. The snow is deep. The ground is not frozen underneath. 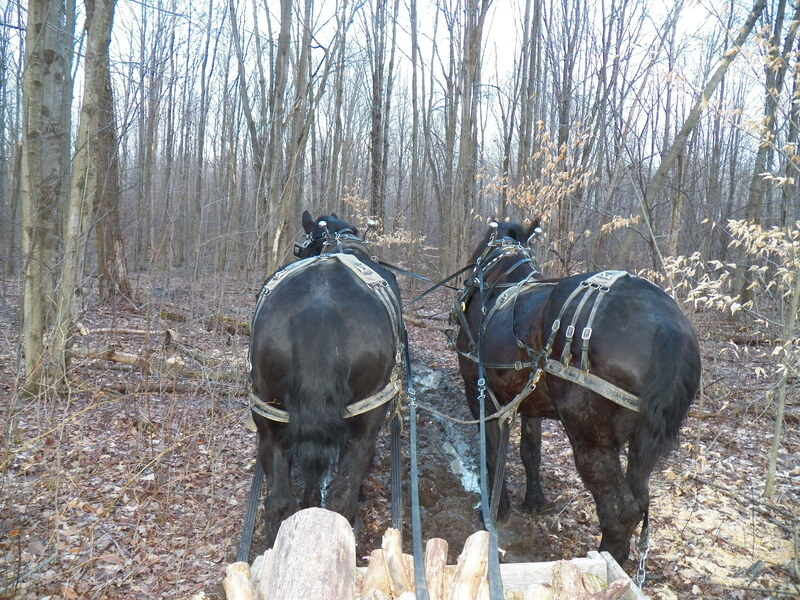 The horses pulled us through the deep snow like we weighed next to nothing at all. We made two trips to the woods and back, filling two pick up trucks with firewood. Our farm had some visitors today as well. A friend of mine who lives in the city, brought his grandchildren out to see the farm. 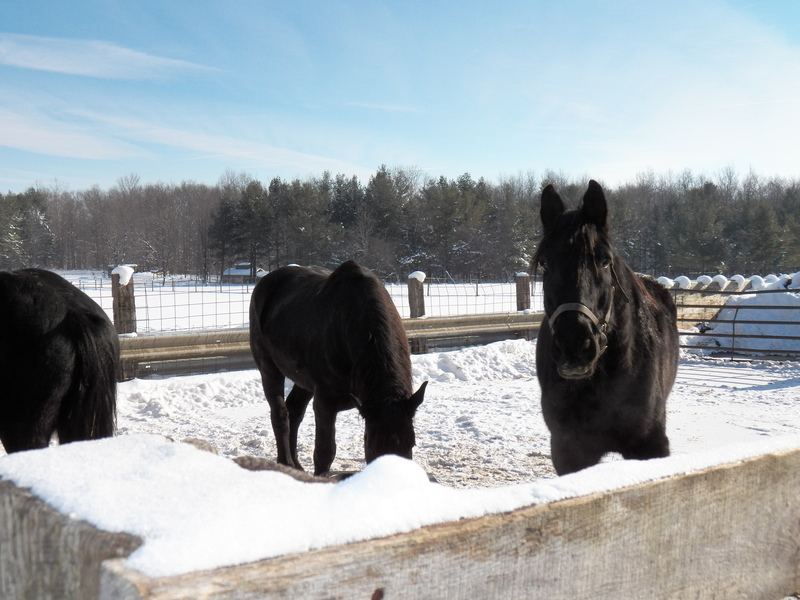 They got to see all the animals and the farm by way of a horse drawn sled ride. I am sure they are still talking about it. They left happy, cold and still brimming with excitement. Once the trucks were loaded, we unharnessed the horses. They were given a drink and some hay. We all gathered in the garage to cut up the now cooled pigs. In just under two hours, the pork was all cut, trimmed and ready for the freezer. It was great looking, fresh pork. I am sure many meals will be enjoyed thanks to those two piggies. I had a wonderful day. I finished up just after 5 pm. One more trip to the barn to check on everybody, walk the dog and enjoy the view of the full moon. I am tired, but satisfied and will go to bed with a greatful, thankful heart. In just a few weeks we will be tapping trees such as this one. 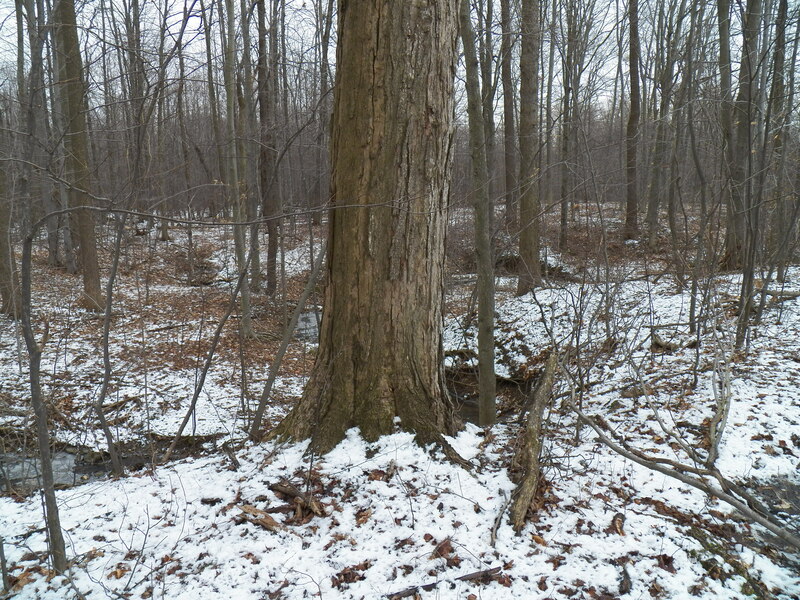 The trees will give up some of their sweet sap, which will become maple syrup after it is reduced down by boiling. A tree this size will have three spiles driven into it. Three is the maximum number you should use. The idea is for maple syrup production to be sustainable. Using three taps on large trees, will still leave plenty of the sap for the tree itself. We tap many trees that only get one spile per tree. This year we plan to tap between 1000 and 950, about double from last year. The sap roads are in place. The spiles and bags are ready to go. The horses have been working, getting ready for the upcoming work. One of my BLOG readers asked for more detail about my sap gathering sled. I searched my photos from last year and could not find a photo of my sled and tank. The equipment is stored away in my “delightful, camoflauged semi-trailer”. A winter storm is bearing down on us, so I will leave it stored until this coming weekend. I will get photos and do an article strictly on the method I use to gather the sap. The end of the day is a wonderful time. I like it when you start to unwind. I do it best after supper and my chores are done. I pause in the barn just before turning out the lights to listen to the horses chew. It is peaceful and makes me feel satisfied. Sounds like a winter storm on the way with some very cold temperatures. Yea! I like winter! I am sure it will force me inside the sugarhouse for that clean up job that waits for me. I am actually looking forward to it a bit. There is peace of mind when everything is ready for the maple season..it makes a guy rest easy at the end of the day. When I was young, I played with other kids like most of us did. We learned to wait our turn. When I was in the U.S.Army, I learned to “hurry up and wait”. As I get older, I realize just how much character those waiting minutes and hours, gave me. I am not real patient. I can find stuff to do for a while, but get antsy fast. I do realize how important it is to wait for my turn to talk…although, I will capitalize a conversation when talking about my farm 😮 I find it rude when people break into a conversation to tell me what is the most important thing on their mind, dump it in my lap, then move on. I am sometimes appalled, but not suprised anymore, by the sheer sense of entitlement some folks have. I have only one other personality type that I disdain more. That person is an antagionist. Someone who lives to push other people’s buttons. I can take quite a bit of stuff from most folks. In my job, plenty of that comes with the territory. I accept it all in stride. I am not good however, with those who lay in wait to kick you when you are down. I have zero tolerence for them. I snapped today. I have no regrets except to myself. I have pretty much held my temper for twenty years…today I held nothing back… and IT FELT GOOD!